The new Dynamic 3D hinge range is characterised by its simple, aesthetically appealing design. 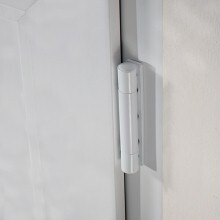 The application range covers house and patio access doors and large windows and is ideally suited to plastic, wood and aluminium-to-wood applications. The three perfectly in-line sleeves underline the slim and elegant design of the Dynamic 3D. A wide variety of powder coated and metallic finishes ensure Dynamic 3D to be suitable for virtually any design, further enhancing the value of your door or window. The Dynamic 3D is easily fitted into the normal architectural hardware milled recess (Euro-groove). Adjustable on three-dimensional settings: +/- 2mm sideways, +/- 4mm in height and a minimum of +/- 1mm gasket pressure (depending on the position of the Euro-groove). This new, three-piece hinge guarantees increased stability and perfect alignment. The installation is also very easy, using a single drill bit and a user friendly jig specifically developed for fast application. As with all SFS hinges, the new Dynamic 3D achieved over 200.000 cycles, tested using a door of 140Kg, confirming once more the quality standards which our customers are accustomed to.